Multi-channel support has rapidly expanded from phone, chat, email and web to include social media channels like Facebook, Twitter, LinkedIn , and company sponsored communities. Your customers are talking about you on these channels, are you part of the conversation? On this webinar learn how to tap into these communities to lower support cost while improving service. Also learn how to engage these communities for feedback and innovation. 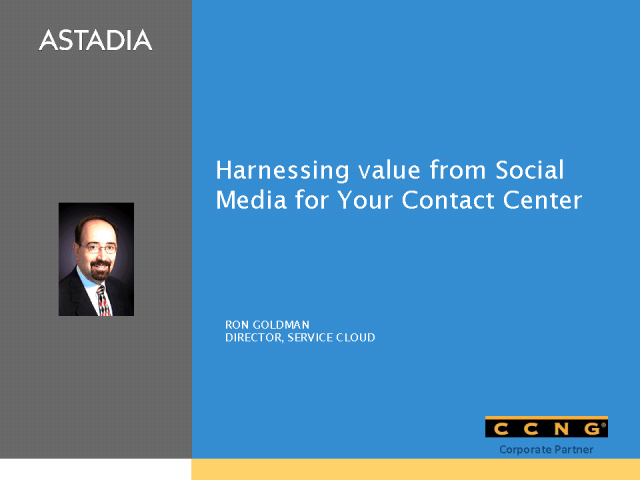 Ron Goldman leads Astadia’s Service Cloud line of business and is an evangelist for Cloud Computing for the contact center. He helps tech support, customer service, marketing and telesales organizations improve the customer experience, build loyalty and improve financial performance. For more than 25 years Ron has been at the forefront of implementing innovative technology that drives business value for the contact center, telecom providers and professional services firms. He can be reached at rgoldman@astadia.com.